Numerous studies document the multiple health benefits of daily low dose aspirin. Aspirin helps to maintain normal platelet aggregation in blood vessels via several mechanisms, including suppressing thromboxane H2, prostaglandin E2, and possibly C-reactive protein. Inactive ingredients: acetylated monoglycerides, anhydrous lactose, colloidal silicon dioxide, croscarmellose sodium, D&C yellow #10, Aluminum Lake, hypromellose, hypromellose phthalate, iron oxide Yellow (iron oxide ochre), microcrystalline cellulose, mineral oil, polyethylene glycol (PEG)-400, polysorbate 80 and titanium dioxide. May also contain: FD&C Yellow #6 Aluminum Lake, methacrylic acid copolymer, propylene glycol, starch, stearic acid, talc, and triacitin. Temporarily relieves minor aches and pains. Other therapy as recommended by your doctor. Because of its delayed action, this product will not provide fast relief of headaches, fever, or other symptoms needing immediate relief. Adults and children 12 years of age and over: take 4 to 8 tablets every four hours not to exceed 48 tablets in 24 hours, unless directed by a doctor. Do not use in children under four years of age. Reye’s syndrome: Children and teenagers should not use this medicine for chicken pox or flu symptoms before a doctor is consulted about Reye's syndrome, a rare but serious illness reported to be associated with aspirin. Allergy alert: Aspirin may cause a severe allergic reaction which may include hives, facial swelling, asthma (wheezing), or shock. Stomach bleeding warning: This product contains a nonsteroidal anti-inflammatory drug (NSAID), which may cause stomach bleeding. The chance is higher if you: are age 60 or older, have had stomach ulcers or bleeding problems, take a blood thinning (anticoagulant) or steroid drug, take other drugs containing prescription or nonprescirption NSAIDs (aspirin, ibuprofen, naproxen, or others), have 3 or more alcoholic drinks every day while using this product, or take more or for longer time than directed. Do not use if you have ever had an allergic reaction to any other pain reliever/fever reducer, or right before or after heart surgery. Ask a doctor before use if you have: problems or serious side effects from taking pain relievers or fever reducers, stomach problems (such as heartburn, upset stomach, or stomach pain) that last or come back, bleeding problems, ulcers, asthma, high blood pressure, heart or kidney disease, liver cirrhosis, taken a diuretic, or reached the age of 60 or older. Ask a doctor or pharmacist before use if you are taking a prescription drug for: anticoagulation (thinning of the blood), gout, diabetes, or arthritis. Stop use and ask a doctor if an allergic reaction occurs. Seek medical help right away. Pain gets worse or lasts for more than 10 days, redness or swelling is present in the painful area, any new symptoms appear, ringing in the ears or loss of hearing occurs, you feel faint, vomit blood, or have bloody or black stools. These are signs of stomach bleeding. If pregnant or breast-feeding, ask a health professional before use. 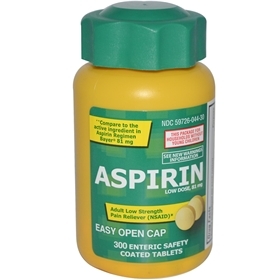 It is especially important not to use aspirin during the last three months of pregnancy unless specifically directed to do so by a doctor because it may cause problems in the unborn child or complications during the delivery. Keep out of reach of children. In case of overdose, get medical help or contact a Poison Control Center right away.